Notre Dame anthropologist "follows the pots"
An Indiana Jones-style expedition might be one way to locate 5,000-year-old Early Bronze Age artifacts like those University of Notre Dame associate professor Meredith S. Chesson studies. 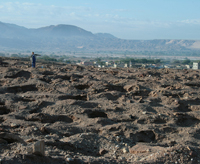 Her ongoing project, “Follow the Pots: The Social Lives of Early Bronze Age Artifacts From the Southeastern Dead Sea Plain, Jordan,” documents the extensive looting — mostly by economically struggling local residents — that for decades has affected the area in and around the Jordanian cemetery at Fifa. Online collectors, she says, typically pay around $250 for ancient ceramic pots traditionally linked to Old Testament figures as revered as Abraham and to locations as storied as Sodom and Gomorrah. Scholars are still debating the existence of those two infamous cities, but evidence from their era, and from the first walled urban centers of the Middle East, provides a tantalizingly authentic connection to the past for professional archaeologists, collectors and others, Chesson says. 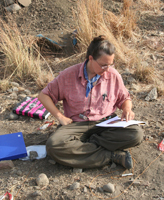 Chesson, an anthropological archaeologist in Notre Dame’s Department of Anthropology, has become an expert on Early Bronze Age civilizations in the Middle East, in part through her ongoing work as publication co-editor on final reports of the 40-year-old Expedition to the Dead Sea Plain. 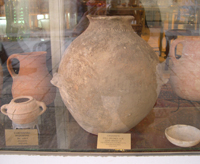 In 2009, she and her research partner, Morag M. Kersel, an assistant professor of anthropology at DePaul University, received a grant of approximately $25,000 from the prestigious Wenner-Gren Foundation For Anthropological Research Inc. to fund “Follow the Pots.” The pair has also received logistical support from Notre Dame’s College of Arts and Letters and from DePaul. Using on-the-ground examinations and aerial photographs, their study documents the extent of the looting in the area. It also includes ethnographic interviews with various groups of stakeholders, including artifact dealers, archaeologists, museum staff, collectors, government officials, local inhabitants and the looters themselves. The interviews, Chesson says, are designed to explore how these different stakeholders understand their connection to the past in the form of these pots and archaeological sites, how they think about these materials and how they believe the materials can and should be used. Future interviews with looters, museum curators, artifact dealers and middlemen, she says, may ultimately reveal a better understanding of what the cemetery at Fifa and others like it originally contained. “The vast majority of tombs opened in Fifa have been opened by looters and not archaeologists,” Chesson says. Although their findings are not yet published, Chesson allows that she and Kersel have already “raised hackles” by questioning traditional ways of thinking about both archaeologists and looters. Historically speaking, “part of what (academia has) been trying to do is establish us as the good guys, and the looters as the bad guys,” Chesson says. Issues of right and wrong become murky, she says. “Frankly, I’m not willing to tell someone that putting a 5,000-year-old pot in a museum is more important than feeding someone’s kids,” she says. Back at Notre Dame, Chesson says “Follow the Pots” has also sparked some interesting discussions in her classes, which include Fundamentals of Anthropology, Gender and Archaeology, and Anthropology of Everyday Life. The project resonates with her students, she says, because the ethics of archaeological research is such a central concern within the profession. “The ‘Follow the Pots’ project is the most exciting thing I’ve done in a long time, and it’s pushing me to think about anthropology in new ways,” Chesson says. Originally published by Mark Shuman at al.nd.edu on April 3, 2012.